This entry was posted on September 1, 2015 by Theresa Frassrand. September, the month of Our Lady of Sorrows, remembers the suffering of Mary, Jesus' Mother. 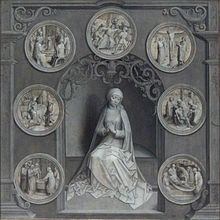 There are seven sorrows, seven afflictions that pierced her heart. Catholics commonly reflect upon each and they say daily one Our Father and seven Hail Mary's for each.